This set of Eleven beetle and butterfly photoshop brushes are the start of a new project, I'm booked in at Roundhay Park, tropical world to take some hi res pictures of their butterflies, which should be good. I have also just borrowed a victorian book with fabulous black and white etchings of butterflies, moths and dragonflies, should be adding some more of these butterfly photoshop brushes to the site in the near future. 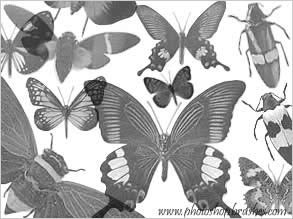 I also have a selection of Butterfly Colouring pictures which I might be make into brushes.